Does your business have a Facebook or Twitter account? Maybe both? Not always sure what to be posting? Now your customers can create the content for you, all while giving you feedback to help improve your business. All you have to do is look through the great comments and choose which ones to share! Over 75% of customer messages received are positive. 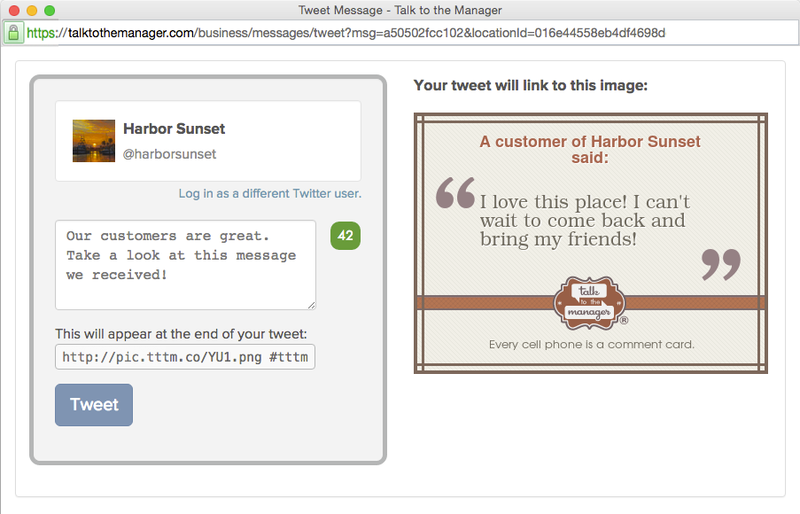 Share customer comments on Facebook and Twitter with just 2 clicks. You choose what to make public. Texts are anonymous - you're free to share. With Social Sharing, your customers can now provide your Facebook and Twitter content for you and all you have to do is push a button! Take 2 minutes to sign up for TalkToTheManager. Print out the sign with your new TalkToTheManagerphone number on it (we automatically make it for you when you sign up) and put it in the most obvious place for your customers to find it. Receive texts from your customers telling you how awesome you are. Log in to your account, go to your stored messages, and click the Facebook and Twitter buttons next to each message (see screenshot below). We do a computerized analysis of all the text messages sent by customers (no humans see your customers' messages but you), and we were surprised to find that over 75% of the messages received are positive. Which means you will have a lot of testimonials to share in your social circles, driving more traffic to your business. Comment cards and surveys get small results. Plus, they are a one-way feedback tool that adds another thing to your to-do list. So burn the comment cards, and ditch the surveys. One-way feedback is soooo 2012. Feedback should be something more - it should be customer service: a two-way conversation that leaves everyone happy before they leave your store. With TalkToTheManager, customer feedback is now customer service. Get your customers' feedback in real-time, have the opportunity to respond, and share all the great testimonials that are coming directly from your customers' fingertips!